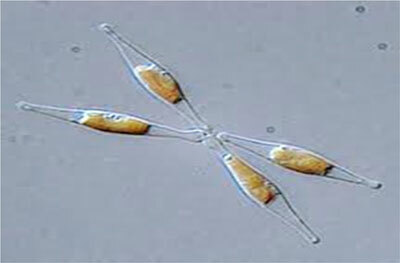 (Nanowerk News) Diatoms play an important role in water quality and in the global climate. They generate about one fourth of the oxygen in the Earth’s atmosphere and perform around one-quarter of the global CO2 assimilation, i.e. they convert carbon dioxide into organic substances. Their light receptors are a crucial factor in this process. Researchers at the Leipzig University and the Helmholtz Centre for Environmental Research have now discovered that blue and red light sensing photoreceptors control the carbon flow in these algae. These results have been recently published by the scientists in the well-known online trade journal, PLOS ONE (" The Acclimation of Phaeodactylum tricornutum to Blue and Red Light Does Not Influence the Photosynthetic Light Reaction but Strongly Disturbs the Carbon Allocation Pattern"). “Diatoms display a special way of reacting to light and adapting their metabolism to the changing light conditions in the water", says Prof. Dr. Christian Wilhelm, Head of the Plant Physiology Department at the Leipzig University. “For the first time, we have been able to show that the light receptors, which measure the intensity of the blue or red light, not only change the genetic transcription, but also directly control the activity of enzymes in the metabolism." A rapid light change from blue light to red light and vice versa does not influence the photosynthesis output, but the metabolism is drastically reversed within 15 minutes. “This way, cells that have grown in red light, which continue to be cultivated in a blue light environment can still perform photosynthesis, but can no longer grow.” These “light switches” can be used to control the carbon flow in cells. The evidence for this was provided using the MetaPro metabolomic platform established at the Helmholtz Centre for Environmental Research. “This opens up new ways for the biotechnological control of cells”, explains Christian Wilhelm. “This work is further evidence of the added-value of intensive cooperations between non-university and university institutions, particularly with the Faculty of Biosciences, Pharmacy and Psychology”, Prof. Martin von Bergen, Spokesman of the Department of Metabolomics at the UFZ and one of the co-authors, is pleased to say. The Leipzig-based algae experts in plant physiology at the Leipzig University already drew attention to itself two years ago with another publication: Together with scientists from Karlsruhe and Bremen, they provided evidence that sunlight can be converted into pure natural gas in a highly efficient manner with the aid of microorganisms. In doing so, the metabolism of green algae is reversed.